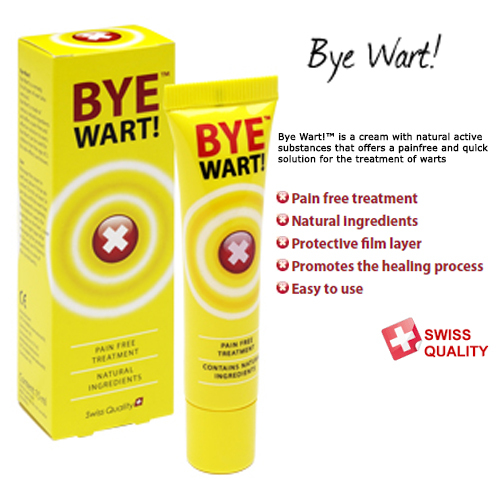 Bye Wart!™ is a cream with natural active substances that offers a painfree and quick solution for the treatment of warts. Bye Wart! contains various natural ingredients that each have their own proven efficiency in the removal of warts. Bye Wart! deposits a protective film layer of the wart, which protects the wart and allows the active substances to remove the wart and stimulate the healing process. Bye Wart! is easy to use and suitable for children and diabetics. Wash you hands thoroughly before and after use. Do not use a pack of Bye Wart! that has been used by someone else. Stubborn warts (for example verrucas) require a longer treatment. It is advised to cover the wart with air-tight tape after the product has been massaged in.